Raw Power! Protein Superfood Powder and Raw Warrior Protein Powder are designed to be blended or added into your homemade shakes and smoothies. Always strive to use fresh, raw, organic ingredients - your body will thank you for it! Fresh fruits: bananas, peaches, mangoes, etc. For super nutrition, take Thor's Hammer tablets with your daily smoothie. 150 Thor's Hammer tablets. This meal is the top superfood nutrition on the planet! Recipe for Thor's Ultimate Superfood Meal! Blend all ingredients until desired consistency. Then, depending on your tablet-swallowing capabilities, with each swig of your smoothie, take 3-15 Thor's Hammer tablets. Shake in a container with lid. Because they don't require a blender, these shakes are easy and you can make them anywhere: on the go, at the office, etc. Hint from Jolie: even just a bit of dark berries like blueberries, blackberries, and huckleberries will mask the color of the greens and give the smoothie a nice color (greenish/brownish/orangish smoothies can sometimes be a turn-off to the young or skeptical!). Blend all ingredients for a few seconds. Add ice and blend, adding more ice until it reaches milkshake consistency. This is usually sweet enough without sweetener, but you can always add agave for those with a serious sweet tooth! Blend ingredients together with enough ice to give it the "Starbuck's Frappuccino" consistency and enjoy! I always double blend to get a really great texture to the drinks. Once you add the ice, this makes a really large amount so prepare to share! Note: for those who are limiting their cacao intake, you can always omit the cacao and add a bit more carob if needed. Blend ingredients with ice until it reaches 'milkshake' consistency. This has been a big hit with my kids and a great summer treat!!! I know this isn't completely "raw" but I wanted to submit it, because there might be other people like me, who aren't totally raw and who are busy, but want to eat as well as they can. I take one Odwalla smoothie (there are a bunch of flavors I like but they are a little sweet on their own) and pour it into a larger container and shake it with 1/4 cup Raw Power and sip on that all morning. My wife does the same thing with soy milk that she keeps in the small fridge where she works. Love your product and its contribution to my road to wellness - Thanks! cup of young coconut "meat"
The Perfect After Workout Smoothie! Not only will this drink feed your muscles as an electrolyte replacement, it will make your next workout oh-so-much easier. Makes one large smoothie. Drink slowly (for better assimilation), and feel true delight! 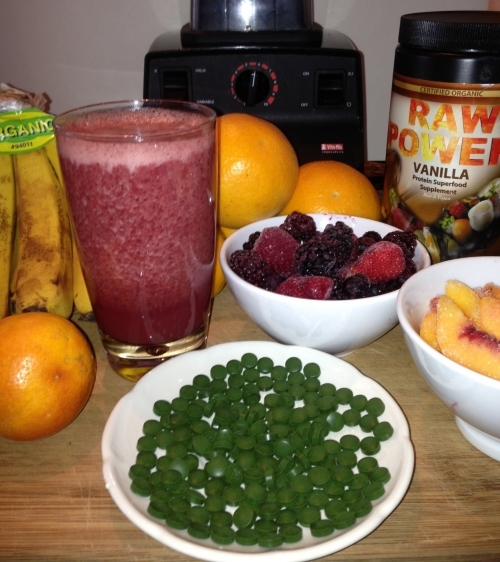 Submit your favorite Raw Power Smoothie recipe!